Imagine waking up to a view of clear skies meeting the never-ending sea or basking in a glinting blue pool on a sunny day with family and friends. How about staring into the yellow-orange sunset with flecks of purple clouds ending a blissful day… sounds like the perfect escape huh? Friends and guests, leave all worries behind and step into a world that offers the best of nature to remind you of the things that matter most in life: wonder, joy, peace and contentment. 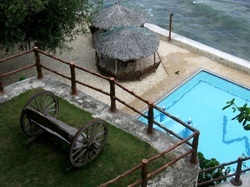 Nestled at the quaint town of Dalaguete is a haven of calmness ideal for the mind, body and spirit. 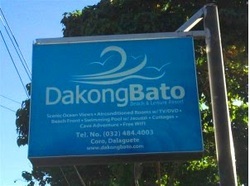 Welcome to Dakong Bato Beach and Leisure Resort. For barkadas who just want to chill and hangout, the funky “Flintstones” cave is perfect for such bonding while the “Suite Heart” cave located behind the pool, which happens to be the source of the resort’s spring, offers a little privacy for couples having their own escapade. One was an infinity pool located on the right and the other pool was the one that had the slide. 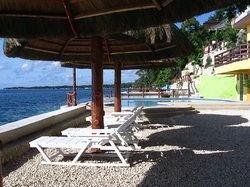 Cottages located near the pool range from P100 - P300 depening upon its size. 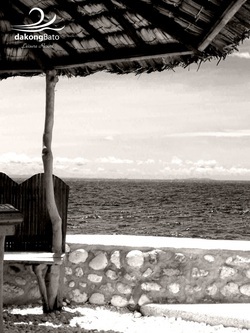 Each cottage come with its very own table and set of chairs for your utmost comfort and of course, safety of the food that you bring. Eating is surely a festive experience as you round up family and friends in a cottage of your choice! A quaint room epecially made for couples and honeymooners in avocado green dotted by purple tints with a mahogany brown contrast. Completely furnished with a mini liing room, comfortable bed, bathroom, mini bar and a terrace that overlooks the beautiful sunrise, the Green House is sure to leave a happy smile to one's face for being surprisingly refreshing and funky at the same time. Located at the upper part of the Reort, the Guest House has 2 family rooms on the lower floor completely furnished with beds, dining area and a bathroom ensuring a comfortable stay for families and friends with a minimum of ten heads. The upper level contains smaller rooms ideal for couples and honeymooners as well as 2 rooms that come with a loft, ideal for barkadas of less than 10 heads. Extra pillows and mattresses are available at P100 per head. The rooms on the left area offer terraces with a panoramic view of the sea to greet guests as soon as they wake up every morning. 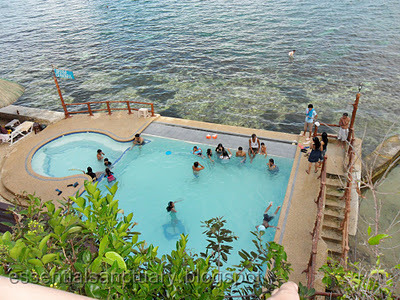 Aside from its sparkling blue color which one can't wait to dive into, its unique main feature is its child-friendly section which has a more shallow water and cemented wall that divides it from the adult section. Now, mommies need not always be beside their children knowing that they are safe; hence, kids and the young at heart can enjoy the pool and its amenities to the fullest. 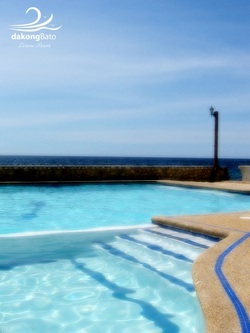 Pool also comes wth a slide and a jacuzzi at 5 feet deep for adults and 4 feet deep for kids respectively. Round in shape and pleasantly relaxing to stay in, the swing is ideal for friends who just want to hang out and catch up on each other's lives as well as couples who are spending quality time with each other through talking and basking in the glow of each other's undivided attention. 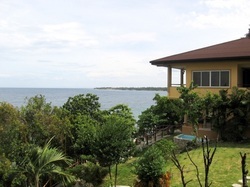 Rise and shine early morning and step out into the Green's House terrace and be awed by the sight of the beautiful sunrise giving flecks of yellow and orange reflections, making the sea gliny, ushering a new and beautiful day. Viewed from the upper level of the resort, the pool is invitingly blue while the surrounding sea gives an interesting blue green complement with waters that literally glitter in the sun.